Smörgåsbord Squad is the new project of Jacques Nyemb, under his Not So Super Comics banner. With the art talents of Justin Wood and Kayla Miller, Nyemb brings to life the saga of a group of food-themed vigilantes who protect the city of Hasenpfeffer, USA, from the evil H.U.N.G.E.R. Pack. 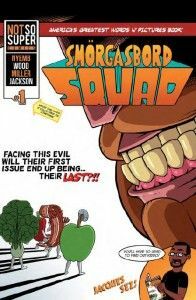 This first issue of Smörgåsbord Squad features two stories, one detailing the Smörgåsbord Squad’s struggle against H.U.N.G.E.R. Pack and short origin story. In the first part, the beautiful city of Hasenpfeffer, USA, is made a little less beautiful as the feud between the Smörgåsbord Squad and H.U.N.G.E.R. Pack spills into the streets. In the second story, the origins of the Smörgåsbord Squad are explored as the details of the day the group came together are revealed. Nyemb tells the story of the Smörgåsbord Squad with a lot of fun and levity. A group of food-themed superheroes is inherently ridiculous, and Nyemb, Wood, and Miller play it up. It’s an immensely fun read, with Wood and Miller’s art both being something as much at home in comics as it is on a Saturday morning cartoon. The book as a whole is lots of fun, nothing too serious, but features a cast of diverse and cool characters. Few other comics feature a man decked out in bacon or a woman dressed in an apple costume with a mini-satellite receiver, but this comic makes those ideas work so, so well. While few comic nowadays are appropriate for kid and adult alike, Smörgåsbord Squad is something I’d be happy to share with my 5 year-old nephew and I think he’d love it too. Smörgåsbord Squad gets off to a fun start and lays down a pretty promising concept. This, like the other Not So Super Comics works, will be available through an upcoming Kickstarter campaign. Can’t wait for that? Read the first five page of Smörgåsbord Squad here and check out some of the other titles while you’re at it. Thanks so much for the awesome review! I’m glad you enjoyed and hope you enjoy what we have in store!